Cloud computing has transformed the tech world in a short time, pushing businesses of all kinds to adopt software and services that can be used anywhere, and on any machine. Some huge hardware and software companies have been left behind, but others have changed the way they work and what they offer to become major providers of cloud computing technology. This is the second article in a three-part series on the CEOs of some of the largest tech companies in the world, and how they’ve helped their organizations adapt to, and thrive with, cloud computing. How did a guy who got his start at a company known for making cash registers and ATMs wind up leading one of the largest cloud computing companies in the world? 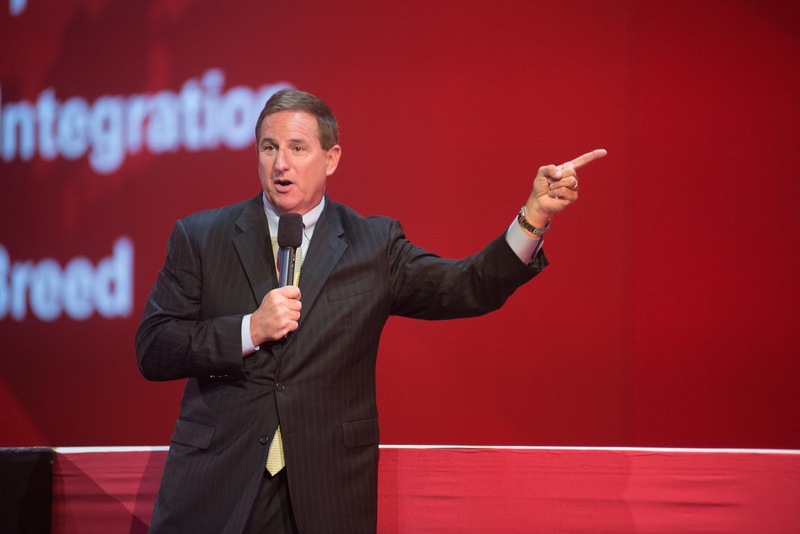 For Mark Hurd, the CEO of Oracle, the answer lies in his approach to leadership. He’s said that “inertia is always our biggest enemy,” and through three CEO positions spanning nearly two decades, he’s worked hard to propel lumbering technology companies into the future. Hurd’s professional career began in 1980 when he joined the San Antonio sales team of NCR, one of the oldest “tech” companies in America. Its founding in 1884 predates General Electric’s creation by eight years, and for much of its history, it produced cash registers — NCR originally stood for National Cash Register. NCR began producing its own computer systems two years after Hurd joined the company, but for much of his time there, NCR was known best for its ATMs. It wasn’t until AT&T bought NCR in 1991 and combined the ATM maker with Teradata, its existing database systems and data-warehousing subsidiary, that Hurd’s career as a tech executive truly took off. By 1996, AT&T had decided to spin out the combined NCR-Teradata as an independent company. Three years later, in 1999, Hurd took command of Teradata in the once-again independent NCR. He built Teradata into a $1.2 billion business over the next four years, and after further promotions that resulted in successful stints as NCR’s president and chief operating officer, Hurd became NCR’s CEO in 2003. This track record brought him to the attention of Hewlett-Packard’s board of directors in 2005 as they grappled with replacing ousted CEO Carly Fiorina. By the time HP hired Hurd, he’d already quadrupled NCR’s stock price in just two years. The stock market reacted to news of his new role at HP by sending HP shares 7 percent higher and shares of NCR 14 percent lower the day his HP hiring was made public. There aren’t many executives who command that kind of response from Wall Street. Within four years, Hurd transformed a formerly-floundering HP into the world’s largest technology company by revenue. He solidified HP’s market leadership in PCs and printers and also began the company’s push into higher-margin software and services, a push that culminated in the 2015 separation of Hewlett-Packard into hardware-focused HP Inc. and software and services specialist Hewlett Packard Enterprise. Some notable acquisitions during Hurd’s tenure at HP included: software developer Mercury Interactive for $4.5 billion; Opsware — one of the first self-identified software-as-a-service (SaaS) companies in the world — for $1.6 billion; IT consulting firm EDS for $13.9 billion; and networking hardware manufacturer 3Com for $2.7 billion. At HP, Hurd was also an early pioneer of streamlined tech infrastructure, a hallmark of cloud computing. Four years into his HP tenure, Hurd had reduced the number of applications the company used by 75 percent, had the company running on 92 percent fewer data centers, and cut its internal IT department by 11,000 people. His efforts to standardize and streamline HP’s hardware and software would closely parallel later efforts at Oracle to do the same for that company’s customers. Hurd left HP in 2010, having overseen a doubling of the company’s stock price and a 60-percent rise in revenues despite leading the company through the worst worldwide economic recession in nearly a century. He soon landed at Oracle, trading in his role of updating a hardware company to compete in an increasingly software-focused world for one where he would transform a pre-Internet database software titan to world-class cloud competitor. The Oracle role presented a collaborative opportunity for Hurd. He served as one of two company presidents alongside longtime Oracle financial executive Safra Catz, with both reporting to founder and CEO Larry Ellison. When Ellison stepped down to become CTO in 2014, he elevated Hurd and Catz as CEOs, a rare scenario in Silicon Valley, where authority typically flows downward from a single executive. Ellison’s faith in Hurd was built on the longstanding relationship between HP and Oracle, which had been a major buyer of HP hardware to run its network infrastructure. At the time of Hurd’s hiring, however, Oracle was in the process of digesting its $7.4 billion acquisition of networking hardware and software company Sun Microsystems. This talent for integration would soon be put to use driving Oracle to the cloud. Within a year of Hurd’s hiring, Oracle rolled out the Public Cloud, its first significant software-as-a-service (SaaS) and platform-as-a-service (PaaS) offering, and it’s been rapidly expanding and refining its cloud offerings ever since. When Mark Hurd joined Oracle, it was known primarily as a database company that served the world’s largest businesses with complex solutions installed on-premises. Today, it’s becoming known more for its huge array of SaaS, PaaS, and infrastructure-as-a-service (IaaS) offerings, which together combine to create one of the deepest rosters of cloud services in the world.